35 years ago, my brother told me his mother-in-law needed to rehome her cat, a “funny looking” Manx with a bad habit of scratching furniture. Would I take her? 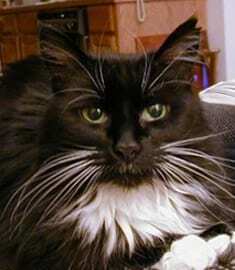 She was a beautiful, plush Tuxedo with powderpuff tail, and the longest whiskers. Bugsy never got over her bad habit; she destroyed two couches. In the night she’d get up from the foot of the bed, go into the living room, and VERY QUIETLY scratch the couch. Couches were just her thing. She was the smartest animal I’ve ever known. I got the feeling she understood every word I said, and like Harpo Marx it wasn’t that she couldn’t speak – she chose not to. At age twenty+, a shadow of her ferocious self, I accepted it was time to let her go. Even all these years later, I can put myself back in that office, holding her emaciated body, waiting for the vet tech to come in. The thought of someday being able to clone Bugs was the only thing that made me feel a tiny bit better. The thought of another animal with something of her spirit, and bad habits, remains a comfort. This couch isn’t going to destroy itself!